BLACK PAISLEY is a Classic Rock/Melodic Metal/AOR band via Stockholm, Sweden. The band has been formed by some of the most experienced studio and tour musicians who after performing as cover bands, decided to compose, record and release some original material. Naming themselves BLACK PAISLEY, the band named themselves that after Ritchie Sambora’s signature guitar. This fact alone should clue you in for the Melodic Rock/Metal journey we’re about to embark on with their sophomore album, “Perennials”. Opening with a strong showing, the band presents “I Want Your Soul”. Immediately, I was reminded of late 80’s power ballads that overtook the Metal world. Yet, here the band adds a welcome and unique twist. Rather than trying to duplicate a “vintage” feel, they utilize some top notch production to ensure “Perennials” retains a modern, even elegant non- nostalgic feel throughout.“I Want Your Soul” is a track that AOR radio and MTV would have made a classic back in the day. It’s got a catchy chorus, some wailing guitar, and great musical hooks. It’s easily the best track on the album, and left me wishing the remainder of “Perennials” had the same heavier edge as the opening cut. Don’t take this as me panning the album, because I’m not. The rest of the album has some definite stand-outs. Songs such as “Miss Me”, “Alone” and “Step Back” retain much of the same rocking DNA as “I Want Your Soul”, just with a bit less overall zest. My only real critiques of the album are that many of the slower paced power ballads become overly similar in sound and presentation. “Sometimes”, “Day By Day” and “Think” all fell a bit flat for me. While in addition to the opening track, I really enjoyed “Mother”, “Without You” and “Think”. 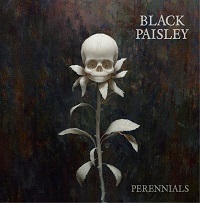 Musically, BLACK PAISLEY is an outstanding collective of musicians. Vocalist Stefan Blomqvist is quite impressive indeed. At times channeling David Coverdale, and other times Eddie Vedder, he manages to retain his own identity and make his own original mark on this collection of songs. Ulf Hedin’s guitar work is memorable as well, if a tad too understated for my tastes. That would be my only issue with the production on “Perennials”. Hedin is obviously a very talented axe slinger, yet his solos and runs are kept at a minimum, and low in the mix. At times, inaudible even. But overall, the positives far outweigh any of the slight imperfections. This is a damn good album, and a fine follow-up to 2017’s “Late Bloomers”. It’s a shame that quality music like this is virtually ignored in America these days. Or at least ignored by American radio. A shame indeed.